By Mark Bronski, Manager, Laser Production, Trumpf Inc. If you were offered $1000 to go an entire day without interacting with lasers, do you think you could do it? What if you also couldn't use anything that had been built with the help of lasers? Doesn't sound too hard, does it? Think again. If you lead a normal life and use some of the modern amenities around us, you inevitably come into contact with products that were created with or contain a laser. "How can this be?" you might ask. "I don't see any laser beams flashing around me. I don't hit an 'ON' button on a laser every day." But if you stop and think about all the uses lasers have, you'll be pretty surprised. Let's take a journey through a typical day of a normal citizen, a citizen whose life may not be that different from yours. As you can probably guess, lasers greet you at every corner. If you're like most people, your alarm clock ushers in each new day. You may take for granted being able to look over and see the time on the alarm clock. Others, who wear contact lenses or glasses, are not so fortunate, while yet others can put the days of squinting at the alarm clock first thing in the morning behind them. Thanks to laser eye surgery, you may not have to fumble for your glasses or try to guess if that's a 7 or a 9. As its name implies, such vision correction procedures involve the use of a laser, an excimer laser to be exact. These lasers generate UV light that is used to modify the lens of the eye, thereby restoring vision to near perfect. Once you've checked the time and made your way into the bathroom, your next step may be to shave. Take a look at your razor. Depending on what kind of razor you use, you might notice the metal blades have small dots on them. These are actually welding marks. Want to venture a guess as to how this welding was done? If you guessed with a laser, you're right! The blades are welded on using Nd:YAG lasers, at a rate of more than 100,000 spot welds per hour. As the morning preparations continue, you'll probably turn on the TV to watch the morning news. If you have a flat-screen TV, the front glass on the screen is an integral part of the picture transmission system. CO2 lasers have been introduced to "cut" these thin glass sheets. And, hopefully, before leaving the house, you get dressed. Even the clothes you wear could have been produced with the help of lasers. Many clothing manufacturers use CO2 lasers to cut the patterns and individual pieces of cloth for each garment before they are sewn together. Your journey to work is filled with more laser interactions. Everything from the car that you're driving to the snacks that you buy at the convenience store to the cigarette that you may be smoking are produced with the help of lasers. 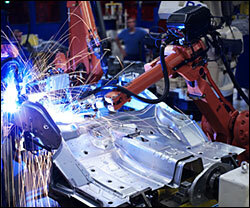 Cars have become rolling models for how lasers can help make higher quality products more efficiently. Some car manufacturers use Nd:YAG lasers mounted on robotic arms to weld entire car frames together, resulting in a stronger and stiffer frame than in cars manufactured with more traditional processes. In addition, the numbers on the speedometer and the snowflake graphic on the A/C button most likely were created using marking lasers. These special lasers come in many configurations, each using a different doping element to generate different light wavelengths. Matching the correct laser to the application allows almost all materials to be marked. 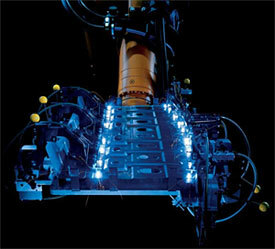 Typically, these lasers are integrated into large production lines and can mark surfaces in only a fraction of a second. If, on the other hand, you take a train to work, you're riding in a sheet metal showcase. The metal panels on the outside of the train car were cut and possibly even welded using CO2 lasers. And the seat supports and even bathroom fixtures were likely laser cut from stainless steel sheet metal. And if you happen to be going on a business trip involving air travel, you can thank Nd:YAG lasers for making this possible, too: The turbine blades used in the jet engines most likely were laser drilled. In this technique, small holes are drilled to form a complex pattern in the blade. This pattern allows air to flow through the blade and cool it, preventing it from overheating. Let's pause for a moment to consider all the ways you've most likely already interacted with lasers, and the day has barely begun! Lasers very possibly affect almost every part of your morning routine and commute to work. Are you starting to reconsider the $1000? It doesn't stop there: Depending on what line of work you're in, lasers are quite prevalent at the workplace as well. Surveyors and carpenters use laser levels and measurement devices to define level surfaces and to quickly measure distances. Lasers also are quickly replacing traditional bubble levels and tape measures, improving the speed and accuracy of using these tools. But maybe you're in a less hands-on line of work. Even if you have an office job, lasers are all around you. If you need the telephone or Internet for your job, you're directly using lasers. The information superhighway and telephone networks are both made possible by semiconductor lasers that transmit light over fiber optic cables. These low-power lasers emit short pulses at various wavelengths and enable the transmission of information at nearly the speed of light throughout the world. Now you've made it through the morning and it's time for lunch. Let's say for argument's sake that you eat out, stepping away from the workplace for a burger at a fast-food restaurant. If you lift the bun and take a closer look at the burger itself, you'll probably notice grill marks on the meat. You may think these are a byproduct of the burger's time spent on the grill in the kitchen, but in some cases, the patties get their grill marks not from a grill but from a laser! Once you're back in the office and resume working on your PC, you'd be hard-pressed to name all the laser applications for a PC because of their sheer volume. But here are just a few: The housing for your laptop was cut using lasers. Inside the housing, the processor and memory chips were made using lasers. 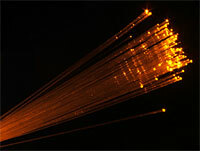 More specifically, lasers are used to selectively remove layers of material during the chip manufacturing process. Now turn your mouse over. See the red light? That's also a laser. And if you need to print out your work when you're done, the chances are high that you'll use a laser printer. After a hard day at work and another commute back home, you may retire to your entertainment center and watch a movie using a Blu-ray player. These new players use a blue laser light to read information from a disc. The blue color is a result of the laser's smaller wavelength than the older red-light ones used to read regular DVDs. And if you're a hunting enthusiast, you most likely have come across laser sighting devices that project a small red dot on the intended target. As the day winds down and you get back to your bedroom for some sleep, lasers are doing their jobs constantly around you. In the 50 years since lasers were developed in a laboratory, entire new industries have been created. Lasers can be found in your pocket ready to draw attention to presentations, and attached to battleships generating megawatts of power to deter potential aggressors. As you get into bed, you may be frustrated that you did not end the day $1000 richer than you began it. Or, you may be inspired by this hidden helper all around us that makes our lives easier and more enjoyable in so many ways. And as you drift off to sleep, who knows, maybe you'll even dream of a new application for lasers that will keep this exciting and versatile tool around for many decades to come.